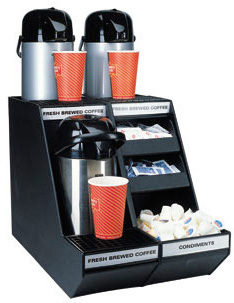 Dispense coffee cups easily, without jamming or spoilage. Store syrup bottles in our fixed or rotating display units. Rack your air pots and accessories in our Air Pot Centre for neat, easy "self-serve" access. Keep messy grounds contained in our knock box disposal units. Display your food products in our stackable storage bins, then reduce the number of units in the stack as you sell through. Browse this section to find all of the dispensing units and accessories you'll need to create attractive, accessible, high volume, self-serve food and beverage stations. Our Plastic Displays & Dispensers are Clearly the Best!